Sourcengo is one of the newest affiliate networks to hit the scene this year. They are a Canadian-based affiliate marketing company that is still in its infant stages of development. It was made available to publishers earlier this year. There is not a lot of information to be found on the web about this company. They are small, employing around 30 employees, and they have yet to establish an active presence in social media. They offer 2 types of ads for publishers: CPC and CPA. Their aim is to provide publishers with a wide range of ad options across both of these ad types. Since its launch in early 2016, the company has seen some steady growth and positive signs. They have 17 listed members that work on the company’s day to day operations. They also have a handful of other staff members that keep everything running smoothly. Their aim is to connect advertisers together with publishers using their advanced tools and platform. They provide support to both the publishers and advertisers in order to help them excel in their respective areas. What We Like: The company appears to have a promising future. Although there is not a lot of discussions to be found about the company, there are also no negative reviews or bad comments so far either. That alone creates distance between a new and promising affiliate network vs. an affiliate network that is destined to fail. We also like the ad types that they are offering. Between their CPC and CPA ads, there is something for every publisher here. They’ve also been working on CPL ads which are not public quite yet. The biggest plus is that they don’t have a lot of publishers and advertisers working with them right now. While this will grow on both ends, now is a good time to get started with them is you like the idea of being more of a name and less of a number to account managers. This is a good opportunity to get in early and grow with them. What We Don’t Like: Sourcengo is a new company and as with all new companies, especially in the online space, it’s tough to place a lot of trust in them. They are still in the process of making their CPL ads available to publishers and their advertising client base is still small. In the end, this is a brand new company that doesn’t have a lot to offer yet. It has shown some promise so far, but there is not a lot to get excited about. Then again, what they’ve managed to implement so far is excellent! Prohibited Publisher Content: No artificial traffic or incentivized clicks allowed. Doing so will end your partnership with the network. For Existing Publishers: Emails go directly to dedicated account manager. Note: CPL offers are currently not available. They will be released for publishers in the coming months. The network is planning to offer all three types of “cost per” advertisements to publishers. They are offering the flexibility of multiple ad types along with targeting specifically higher paying commissions. They hope that the combination of these two factors will attract more publishers once the word starts to get around about this company. They display ad content based on the context that the ad is placed in. Their system will select the most relevant ads from their database and display it on your site. This helps to improve click rates since the ad is more likely to be related to what the user is interested in or looking for. 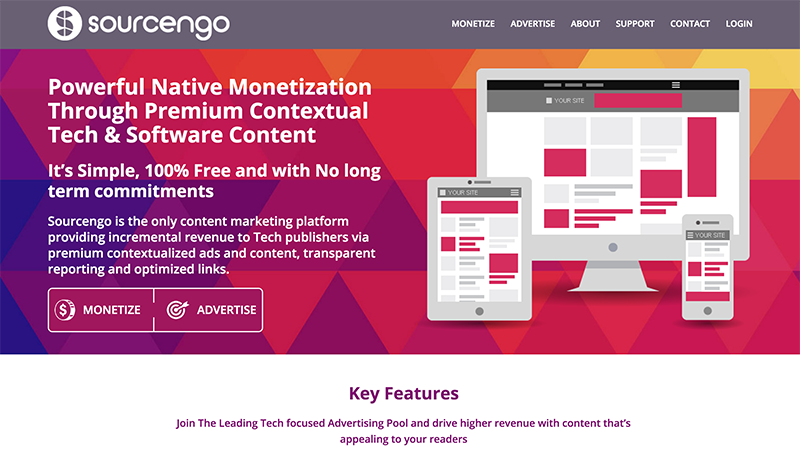 For example, you can expect to display ads that are related to the software industry if you place them on your software site. If the network is unable to match their ad content with the niche your site is focusing on, it will search for the most closely related ad or ads and display them in the ad block. The network offers dynamic ads that will change based on the user’s search history. When a user lands on a publisher’s site, a dynamic ad will display content that is relevant to what they are personally interested in, regardless of the content on the page that it is being displayed on. This is a good ad type to use if you are having trouble with the relevance of the contextual ads that are being displayed on your site. It is recommended for sites that focus on obscure niches or industries that have a low CPC. Both ad types are useful for publishers for different reasons. We like that they are giving us options with these. It allows more opportunity for the publisher to try different ad types to see what works best for them. Along with their customer support, their tech implementation seems to be the best aspect of this network. We gave it an average rating of 3 out 5 because they still have a lot of development left to go with the features and tools that they provide. With that said, they are clearly placing an emphasis on this aspect of what they can offer to both their publishers and their advertisers. We would not be surprised to change this rating to a 5 out of 5 when we come back to update our review of this company in a few years. If technology implementation is important to you, we suggest starting now and using the network passively to give yourself a chance to learn the software and tools that they have to offer before they start to become more advanced and the learning curve goes up. Their control panel is simple to use. This is partly due to a good design, and partly due to the lack of advanced features. Once things get settled for the company, we expect this to improve. For now, they offer just what you need as a publisher. They have all of their tools laid out and easy to find. It is also simple to navigate through the different offers that they have available for publishers. They send payments once per month on a NET-30 setup. Publishers will receive payment at the beginning of each month for the commissions that were made in that 30 day period. They currently pay through PayPal and Wire Transfer. We hope to see them adding more payment options in the near future to accommodate more publishers as they grow. As far as we know, weekly or bi-weekly payments are not available as of now. Their approval process is simple and they are currently accepting all types of publishers. To join, simply fill out their form and you will be contacted by a staff member through email. On the form, you will be asked to provide some basic information including your name, the website that you will be advertising on, your country and your company or blog name. They won’t grill you with tons of questions like some other networks that are more difficult to get into will do. Although the approval process is not instant, it won’t take too long. You can expect it to take 1-3 business days. Overall, it’s a pretty easy process. The assistance that was provided by Sourcengo is good, but what we really liked about it was the unique opportunity it creates. Since they are a new company that was just launched this year, their account managers aren’t at the point where they are being overwhelmed with publishers just yet. This means you will be able to receive more individualized attention from your manager. Not everyone will place a value on this but we do. We feel that it creates a good opportunity to make yourself known to the company and create a relationship with your affiliate manager. This type of relationship will pay off down the road when you want to ask for customized help. They will be more likely to go out of their way to help you with those kinds of requests if they already have an established relationship with you. If you have plans to publish ads long-term, it may be worth it to get started early before they add more publishers to their network. Their customer service is great. We loved the individualized attention that we received from them. It was very different from what we are used to experiencing from larger networks. The ad types that they offer are intriguing. They are committed to providing their publishers with high commission rates. That will save you a lot of time that is normally wasted when you first begin working with a new advertising network. Instead of having to split test the low paying ads out of your site, a lot of that work is already done for you. If you have any interest in getting in on the ground floor and growing with a company, this is a great opportunity to do that. As we mentioned already, this is a brand new company. They are still working on growing their reach with both their publishers and the advertisers that they work with. If you are looking for something more established, this is not the network for you. Although they do offer a nice selection of tools, those tools are still being developed. In time, these tools will become more advanced and functional as they continue to work on and improve them. They don’t have a lot to show for themselves on social media. We were unable to find any social media profiles that the company made. Although this is not necessarily a negative, it just shows you how early they are in their development stages. Their ads are somewhat limited as well. It’s exciting to see a network that is concentrating on all three CPC, CPA, and CPL ad types, but they still need to increase their advertising for their publishers. Their CPL ads are not yet available, so if you are looking at those ad types, you will have to wait a little longer for that. We feel that this network has a lot of promise. From a ground-floor perspective, they seem to be on the right track to continue their growth. We have not found any red flags that would give us any reason for hesitation. After looking over their network, we didn’t feel that they were offering anything that would make us use their network despite their young age. We are definitely going to keep our eye on the network as they continue to grow their company; however, it’s too early to recommend anyone to switch from something else. Give it a try, see how it performs for you and make sure to report back to us!